In Owens Valley, close to US 395, Fossil Falls, also known as Lava Falls, is a short series of dryfalls in a narrow ravine that leads to a wider canyon, all cut through a thick deposit of reddish/black basaltic lava, and formed between 20,000 and 10,000 years ago by a previous alignment of the Owens River, which has since changed behavior, and now terminates 30 miles north in Owens Lake. 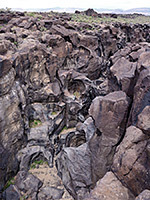 In past times the river carried much more water, fed by melting of glaciers along the east face of the Sierra Nevada, enough to carve a sizeable gorge through the hard, underlying volcanic bedrock in this part of the valley, the most recent of which was deposited 40,000 years ago, associated with the Coso Volcanic Field. Later activity created several cinder cones in the vicinity, one (Red Hill) just a mile north of the canyon. The falls occur where the ancient river flowed over the edge of the lava, eroding backwards to create the canyon, the main, lower part of which is a third of a mile long. The most interesting and photogenic section though is the uppermost 300 feet, as here the river has eroded a series of falls, potholes, fins and arches, all polished smooth by the glacial waters, through rocks that are generally black or tinged with red and purple, and partly covered by patches of bright orange or green lichen - effectively creating a short slot canyon through the basalt. 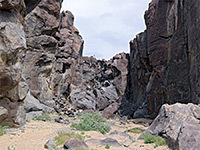 The narrows open out to a wide bench that precedes a bigger drop of about 50 feet to the flat, boulder-covered floor of the lower gorge, an obstacle not passable, though the upper section can be seen by careful climbing. Most people just view the falls from the rim above, however, an overlook reached by a short, easy walk from a BLM trailhead. 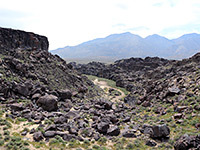 The turning for Fossil Falls is signed from US 395, a junction half way (22 miles) between Indian Wells and Olancha, in generally empty and undeveloped region. The side road is initially paved then has a surface of smooth red ash, running below the southern slopes of Red Hill. A right fork after half a mile crosses more ash, now mixed with patches of lava, ending in another mile at a relatively large parking area, from where the ravine is 0.2 miles away, along a level though somewhat uneven trail over the lava flow. 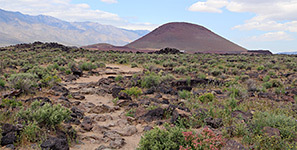 A spur road leads to an area used for primitive camping, while the first road continues, initially to a viewpoint of Red Hill, which is a privately owned feature with a scoria mine at its base, then leads on to other, more remote cinder cones and lava deposits. The main viewpoint of the falls is on the northwest rim of the ravine, but it is easy to cross the streambed above the drop-off and explore the opposite rim as well, walking over rather more undulating lava. All this area has good, long distance views west, across the highway to the steep east face of the Sierra Nevada, the foothills of which are just 2 miles away. 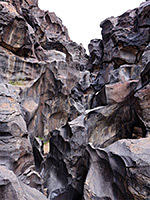 The climbing route into the ravine is initially via a series of short steps, then down a taller crack, aided by several wedged boulders, past a series of sculpted fins and out to a flat area beside a graffiti-covered pothole and arch. The canyon opens out just below, to the bench at the brink of the lower falls, which are not climbable.